Trevor Siemian’s 2017 season began the way his 2016 season ended — taking the snaps behind center as the Broncos’ starting quarterback. It wasn’t supposed to be like this… but the Broncos are lucky it is. All summer long, the word out of the Broncos’ Dove Valley headquarters was the same: second-year quarterback Paxton Lynch had dramatically improved. Newly-focused on studying the playbook, last year’s first-round pick was presumably ready to take the reins as Denver’s signal-caller; the role he was earmarked for when president of football operations/general manager John Elway traded up in the first round to select him. Then training camp started, soon to be followed by preseason games, and while the facts collided with opinions, an overarching narrative began to coalesce: Lynch wasn’t ready. Not only had the strides he had made appeared minimal, one could make an argument that he wasn’t even the second-best quarterback on the roster — that honor seemingly went to Kyle Sloter, an undrafted college free agent out of Northern Colorado. Since then, the Broncos’ quarterback carousel hasn’t stopped spinning. Lynch suffered an injured throwing shoulder in the final preseason content, formally removing himself from a competition that he was part of in name only. Sloter was waived and landed on the Minnesota Vikings’ practice squad. Former Bronco Brock Osweiler was signed to a one-year deal following his release from the Cleveland Browns. 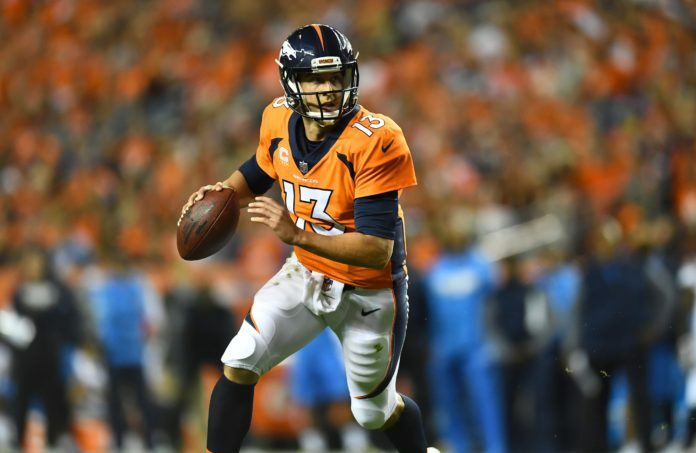 Throughout all that turmoil, only one thing remained steady — Trevor Siemian’s role as the starting quarterback, and his position was never truly challenged. While Lynch’s study habits were being touted, Siemian — already renowned as a team-film buff — wasn’t exactly taking the summer off, and it showed during the Broncos’ season-opening victory. The Broncos’ offensive line is a work in progress — they allowed four sacks against the Chargers, and it could have easily been as many as seven or eight — yet Siemian still managed to function well, given the circumstances. Siemian’s first-quarter touchdown pass to Bennie Fowler came after a scramble to the right side extended the play, and his nifty touchdown run in the second quarter saw the surprisingly-nimble quarterback stutter-step his way past Chargers defensive end Joey Bosa, leaving the budding Los Angeles star on the turf. When the Broncos’ line did manage to give Siemian a clean pocket, he was terrific, completing 13-of-20 passes for 143 yards and a pair of touchdowns; throwing with both accuracy and velocity. Siemian’s second touchdown pass to Fowler, in particular, was a seam-splitting rocket that buried itself in Fowler’s breadbasket for the seemingly-easy six. Siemian’s willingness to stand tall in the pocket and take a hit endeared him to his teammates last season, and they rewarded him by naming him a team captain for the 2017 campaign. While Siemian’s final numbers didn’t dazzle — 17-for-28 for 219 yards, two touchdowns and an interception — he completed passes to seven different receivers, and 14 of his 17 completions went for first downs, keeping the Broncos’ offense moving down the field. For the first week of the season, Siemian’s QBR of 80.8 — a qualitative stat designed to reward efficiency over statistical accumulation — ranked fourth in the NFL, trailing only the Vikings’ Sam Bradford (93.9), the Chiefs’ Alex Smith (91.8) and the Falcons’ Matt Ryan (85.3), and that’s not even considering that the interception Siemian threw should have been nullified by a crystal-clear case of pass interference by Chargers rookie Desmond King, who hopped on top of Fowler long before the ball arrived.